What a delightful, relevant post. As someone from the District, it’s very interesting to note that the National Tree influence the Washington Square tree, especially because of the underlying city rivalry. Hester, this was an awesome post and totally got me in the mood for the holiday. Its always nice to know the back-story to a holiday tradition and this being my first NYC Christmas, I learned a lot! 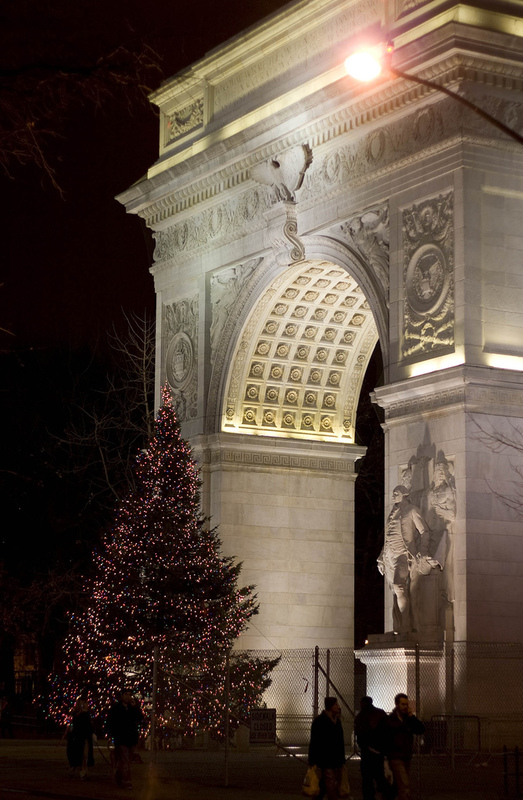 Its sad that NYU no longer host the All Holiday Sing, since that would have been really nice to hear, but I am at least happy the tree is still there. Have you by any chance gone to see if some of the old trees have been replanted in Washington Square Park? I am going to have to check it out the next time I head down that way. Happy Holidays! I was sad that the All-University Sing doesn’t seem to be happening anymore. I didn’t have a chance to photograph them for this post, but I’m processing a collection in the University Archives that has some really hilarious posters for it! If you ever get a chance, some of them are really strange. Really cool post Hester, and as someone said, relevant. Its so refreshing to approach history from the inside out, as opposed to looking at it as a point on a line. Nothing could be more present than a post on the holidays, with a recent picture, and to then get inside the moment, and come back out, is terrific. It works on different levels. Happy Holidays. May we all get through finals in one piece first. Thanks for this post, Hester. I love learning about traditions in the neighborhood. As with so many rituals, it’s difficult to remember or find out why and how a tradition began, so this post was helpful to situate one of Greenwich Village’s greatest holiday traditions! on November 27, 2017 at 11:11 am | Reply Si accende anche l'albero al Washington Square Park!